It’s almost time for the big game, and that means you’ll need to start planning what you’re going to make for your family and friends. 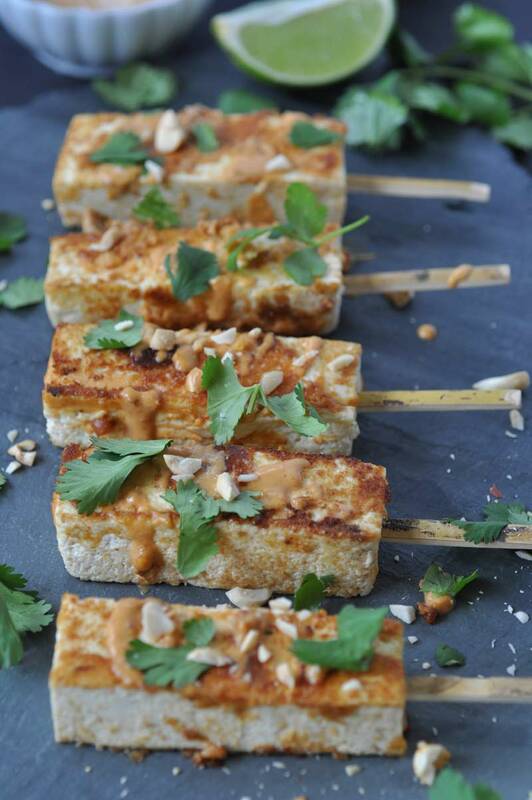 Whether you’re hosting or attending a party, this tofu satay with a peanut sriracha glaze is the perfect appetizer to please the crowd. Okay, it’s not the typical game day food choice that you’re used to. Football food usually consists of nachos, potato skins, or BBQ. That’s cool, I love those foods too, in fact, if you click on the underlined links, they’ll take you to the recipes. However, it’s always fun to add a surprise to the mix, and these pretty little tofu skewers are the perfect snack to shake things up. I was inspired to make these after attending a New Year’s Day house party at a friend’s house. My friends were so sweet and thoughtful, they asked their caterer to include some vegan items for my me and my husband, and peanut glazed tofu squares where one of the many mouthwatering appetizers that they made for us. As soon as I took that first bite, I knew that I was going to recreate them at home so I could share them with you. It took me a few weeks to get there, but we still have a week and a half until the Super Bowl, so it’s all good. The peanut and sriracha glaze makes this dish. 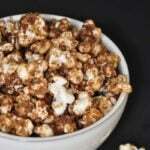 It’s so easy to whip up, and takes less than five minutes once you get the ingredients out of the refrigerator. All you’ll need are a few tablespoons of natural peanut butter, a couple teaspoons of sriracha, some lime juice, sea salt, and water. Mix it all up and then slather it on the tofu and get cooking. EASY! I used a stir-fry oil that I found in the Asian section of my local supermarket to give the tofu satay extra flavor, but you can use olive oil if you don’t want to buy a new bottle of oil. As much as I’d love to say that you can skip the oil, I can’t. If you don’t use it the tofu will stick to the skillet, and you don’t want that to happen. The seared tofu will develop a slightly crisp texture on the surface, which compliments the slightly chewy inside. Perfect! When the skewers are done, plate them on a tray and drizzle more sriracha peanut sauce on them, then sprinkle them with fresh cilantro and crushed peanuts. I’d also suggest saving the extra sauce for dipping. 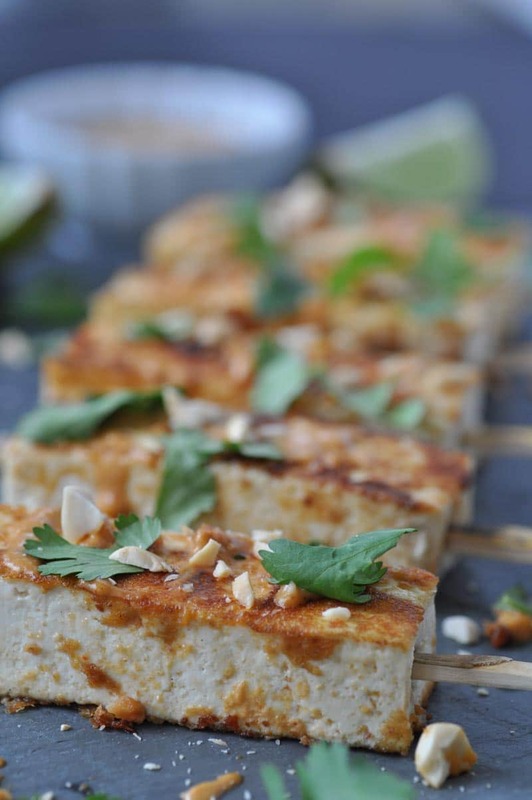 This scrumptious peanut glazed tofu satay isn’t just for appetizers. 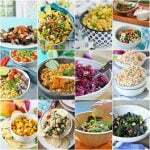 Cube it and put it in a stir-fry, or a power bowl, or keep it simple and put it on a bed of rice with veggies of your choice. Be creative! 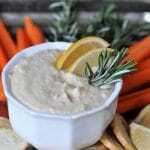 A simple and easy appetizer that will please the crowd. Whisk the peanut butter, sriracha, lime juice, water, and salt together in a medium bowl. Brush a layer of the glaze on one side of the eight sticks of tofu. Heat the oil (you need it to prevent the tofu from sticking) on medium heat in an iron skillet. When the oil is hot put the glazed sides of the tofu sticks down in the pan and brush the glaze on the tops of the tofu. Cook for 2 minutes and flip on to their sides, brush the top sides with glaze and cook for 1 minute, repeat on the other sides, and then again on the bottoms of the tofu. 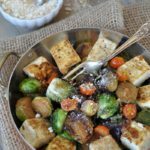 All four sides of the tofu sticks should be nicely seared. Insert a pick into the ends of the tofu steaks and drizzle with the remaining glaze. 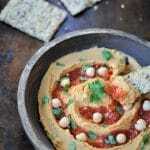 Sprinkle with fresh cilantro and crushed peanuts. Good morning, Trish! Thank you, it's really good. I made a stir-fry last night and my husband ate five of the skewers with it, and then asked me to make more this week-haha! Morning brain fog is for real, trust me, I know. :) One block of tofu makes 8 skewers, so the sauce recipe makes enough to cover the skewers, and you should have more than enough left over for dipping. No need to increase the amount of ingredients for the sauce. Let me know what you think once you make it. Have a great day! 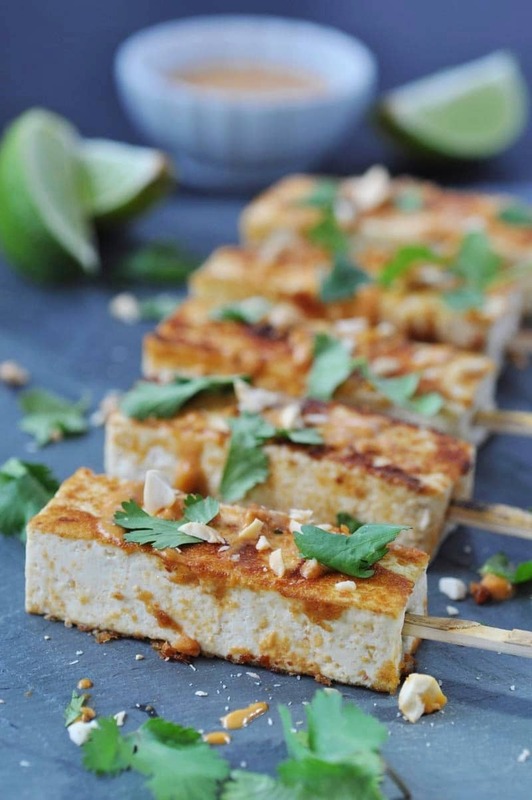 This looks wonderful - peanut and sriracha are such a great way to bring tofu to life. Thanks! Hi Christine! Thank you, peanut and sriracha are one of my favorite combos. My mouth is watering! I'm so addicted to yummy, crispy tofu. This sauce sounds amazing!! Peanut oil would be great for this!